The U.S. Strategic Command has declared the new nuclear command center in Nebraska has reached initial operational capability. The center’s readiness was determined Wednesday, according to an Air Force news release. 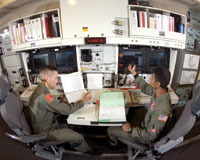 The Nuclear Command, Control and Communications Enterprise Center, known as NC3, is located at Offutt Air Force Base. NC3 is involved in restructuring situation monitoring, decision-making, force direction, force management and planning. Offutt became the host base for the U.S. Strategic Command, known as USSTRATCOM, which was established in 1992 from the Strategic Air Command and the Joint Strategic Target Planning Staff. It comprises the Army, Marines, Navy and Air Force branches. USSTRATCOM has taken over the modernization of NC3 from the Air Force Global Strike Command. Following the Pentagon’s Nuclear Posture Review last May, the Defense Department decided to give it to STRATCOM, the combatant command that oversees the nation’s nuclear forces. USSTRATCOM’s responsibilities include strategic deterrence, nuclear operations, space operations, joint electromagnetic spectrum operations, global strike, missile defense, and analysis and targeting. In 2018, Secretary of Defense James Mattis appointed the commander of USSTRATCOM — Gen. John Hyten — to be the single operational lead for NC3, with increased responsibilities for operations, requirements and systems engineering and integration. She manages more than $20 billion of on-orbit communications assets, as well as implementing communications and information policies across the command. The center is inside the command’s headquarters in Nebraska, with a second location in the Washington, D.C. area.